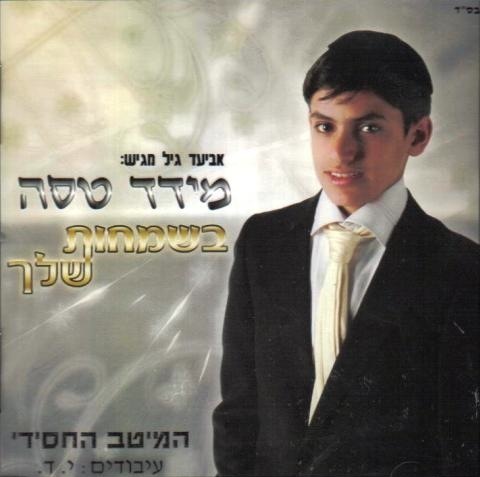 For those of you who haven’t heard of Meydad Tasa, he’s a child solo artist from Israel. Tasa had previously released two albums before this one. Against the Flame & Al Naharot Bavel. While we’re accustomed to hearing Tasa sing with a conventional sephardic song selection, on this album, Basmachot Shelcha, he sings 27 chassidic style, wedding songs, with perfect Ashkenazic pronunciation. His producer, Aviad Gil, characterized this album as a “mainstream album”. CREDITS: On the drums: Asher Pedi, Bass: Aryeh Berkowitz, Guitars: Avi Singolda, Saxophone: Dor Asraf, Trombone: Vitali, Percussions: Golan Kolesh, Violins: Grisha & Symphony. The recordings were recorded and edited in the Gal Kol studio with the mixing done by Gili Telman. BIG NEWS!! : Tasa is preparing another album in his classic sephardic style. It’s to be called “Ben Shel Melech” and will hit the store shelves soon, G-d willing. This album currently, can be bought online at GalPaz or in any GalPaz store.